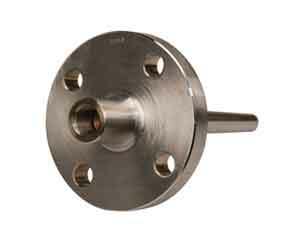 Thermowells for temperature instruments are recommended for all process systems where pressure, velocity or viscous, abrasive and corrosive materials are present individually or in combination. A properly selected thermowell will protect the temperature instrument from possible damage resulting from these process variables. Furthermore, a thermowell permits removal of the temperature instrument for replacement, repair or testing without effecting the process media or the system. 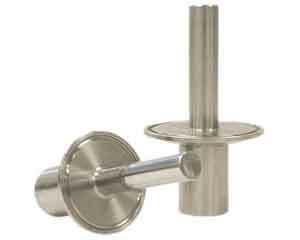 Thermowells come in a variety of styles depending on the use. The most common ones are the: threaded, flanges and sanitary. 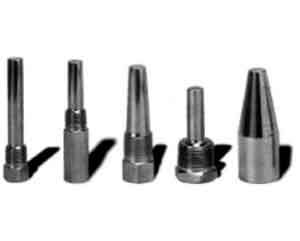 For high pressure and temperature there are also: Socket, Wels and Weld-in types. External means to connect thermowell to process piping system. Wells can be threaded, bolted (to matching flange), clamped or welded in place. Internal threads to connect temperature instrument to thermowell. Length of well inserted into the piping system. Measured from the base of the process connection to the end tip of well. Also called lagging extension. Extends length between the instrument and process connections to accommodate vessel or piping insulation. Standard length is 3" (2" for a well with a 2½" "U" dimension). Instrument insertion length into well. Dimension of internal bore to match the diameter of the instrument stem/bulb inserted into the well. The .260" and .385" bore sizes fit instrument stem/bulb diameters of ¼" and 3/8" respectively. Bore length equals "S" dimension. Diameter of well shank below process connection. This dimension varies with process connection and/or shank design. Diameter of well shank at the end tip of well. This dimension may vary with process connection and/or shank design. Also called reduced tip. The shank O.D. is reduced over the last 2½" of the "U" dimension from the standard root diameter to a ½" O.D. The stepped shank is available with a .260" bore size only. Shank O.D. is the same from the root diameter to the tip diameter. 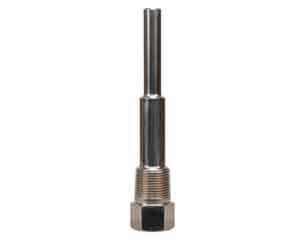 The straight shank is generally used with a .385" bore size but a .260" bore size is available. Shank O.D. is gradually reduced from the root diameter to the tip diameter. Available with a .260" or .385" bore size. The tapered shank is recommended for heavy duty applications characterized by high vibration, pressure, temperature and/or velocity.